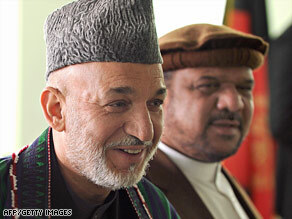 President Hamid Karzai of Afghanistan announced Monday he will run for re-election. The country’s electoral commission confirmed he had filed his candidacy. The Western-backed president announced his two running mates, including a controversial former warlord, Mohamed Fahim. Fahim was defense minister and vice president in a transitional government after the U.S.-led invasion that toppled the Taliban government in 2001, but Karzai did not include him on the ticket when he was elected in 2004. Human Rights Watch was quick to criticize Karzai’s decision to add him to the ticket now. “To see Fahim back in the heart of government would be a terrible step backwards for Afghanistan,” said Brad Adams, Asia director of the group. “He is one of the most notorious warlords in the country, with the blood of many Afghans on his hands from the civil war. He is widely believed by many Afghans to be still involved in many illegal activities, including running armed militias, as well as giving cover to criminal gangs and drug traffickers. The people of Afghanistan deserve better leadership. The president is insulting the country with this choice.” Fahim is a member of the country’s large ethnic Tajik minority. Karzai belongs to the majority Pashtun community. The second vice-presidential candidate, current Vice President Kamil Khallili, is a Hazara, another minority group. The country’s supreme court on March 29 ruled that Karzai will remain in office until presidential elections are held in August, three months after his term is scheduled to end. Karzai’s term is up in May, but the independent commission that will oversee the election has set it for August 20. The court’s decision found that allowing Karzai to remain in power until that vote “is in the interest of the Afghan people and state, and it is also consistent with the spirit and interpretation of the Constitution.” Karzai’s government has come under increasing criticism for corruption and inefficiency, and an earlier effort to move the elections up to April drew criticism from opposition groups and the United States.